Bert Cargill of Scotland, co-author or “Torchbearers of the Truth”, writes the following brief biography of the first man ever to translate the Bible into English, John Wycliffe (1324-1384) “The Morning Star of the Reformation”. John Wycliffe is chiefly remembered as the person who first gave English speaking people a Bible in their own language. His work was done a century before Gutenberg in Germany invented the printing press, so these Scriptures were hand-written, copied with the help of faithful scribes. The ecclesiastical authorities in their blinded zeal destroyed as many as they could, but even today about 150 complete or partial manuscripts still exist showing how widely distributed and valued they had been. 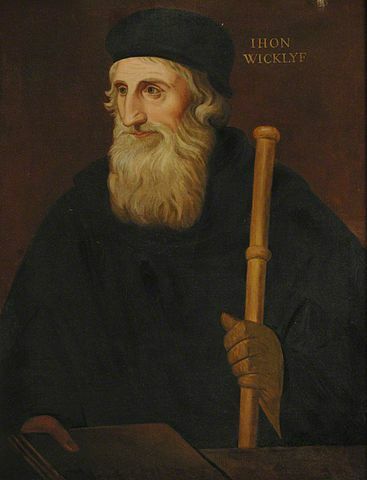 John Wycliffe was born at Ipreswell (modern Hipswell) in Yorkshire, around 1324. His family was large and well to do, with an estate called Wycliffe-on-Tees. He probably received his early education near home, but went up to Oxford before 1345, becoming Master of Balliol College by 1360. His university studies were the usual mix of classics, natural science and mathematics, then philosophy. More significant was his deepened interest in Bible study which led to his Bachelor in Theology degree, then Doctor of Theology sometime between 1366 and 1372. His study Bible was the Latin Vulgate, which was the recognised Bible of the Established Church of the day. Only a few could read it. This Latin version had been translated from the Hebrew and Greek by Jerome and others in the 5th century. But the more Wycliffe studied it, the more it showed up to him the many profound errors in the beliefs and practices of the Church. He felt he had to challenge them. After much spiritual conflict he began to make his revolutionary views known. His conviction was that the Bible alone was authoritative and fully sufficient. Without the knowledge of the Bible, he said, there can be no peace in the life of the Church or of society, and outside of the Bible there is no real and abiding good; it is the one authority for the Christian faith. Thus he recognized and formulated the principle of the Reformation – the unique authority of the Holy Scriptures. The Bible and not the ‘Church’ was the fundamental source of Christian teaching, and this is why he has been called “the Morning Star of the Reformation”. This conviction was also his motivation for translating the Bible into the English language. He believed more and more that the Bible should be made available for ordinary people to read for themselves in their mother tongue to save them from being misled by a few churchmen who could read it and apply it as they wished. Some of England’s nobility possessed a French translation, but no useable English one existed. Wydiffe therefore set himself the great task of translating from the Latin Vulgate into English. It was not all his own work, but it was his initiative. His own translation of the New Testament gave a clearer and more readable text than a version of the Old Testament recently produced by his friend Nicholas of Hereford. When all the translation was completed, the whole Bible was reviewed and revised by Wycliffe’s younger associate John Purvey in 1388. This is how the first English Bible was produced. It was written in ‘Middle English’, a version of the language we would find quite difficult to follow today. To understand the pivotal role of John Wycliffe in the pre-reformation movement of the 14th century, we need to look at the general conditions in Europe at that time. The Church of Rome held great ecclesiastical and civil power, extending to the appointment of kings and sanctioning the rule of law in many countries. A feudal system was in place, requiring the payment of heavy taxes to Rome, ultimately extorted from the poor. Large and ornate cathedrals had been built, with an elaborate hierarchy of church officials and dignitaries. In monasteries all over Europe various religious orders followed their peculiar levels of asceticism or leaming. Abuses were rife. The Church and its officials were becoming increasingly rich, and many of them including some of the popes were overtly immoral. More and more property and land was being acquired by the Church, all at the expense of a deluded and darkened populace. Generally the medieval scene is one of majestic religious buildings in key locations with elaborate religious rites and ceremonies understood by only a few, alongside spiritual darkness, superstition and poverty among the many. The true Gospel of apostolic days had disappeared and everything was far away from the church described in the New Testament. And social conditions were dreadful – the Black Death was spreading and would soon destroy one third of Europe’s population. A sincere and studious man like Wycliffe quickly saw how vast was the gulf between what the Bible taught about the church and what he saw around him. Theologically, he based his views on a belief in the ‘invisible’ church of the elect, made up of those who are saved, rather than in the ‘visible’ Church of Rome. Wycliffe wrote, “The Church is the totality of those who are predestined to blessedness. It includes the Church triumphant in heaven…and the Church militant or men on earth. No one who is eternally lost has part in it. There is one universal Church, and outside of it there is no salvation. Its head is Christ.” He made his views known in written pamphlets and in his preaching and soon deep hostility to him arose in many quarters. He also insisted that the Church should be poor, as in the days of the apostles. This too aroused controversy and anger as it militated against the vested interests of the religious hierarchy and their financial ambitions. But when he preached in London’s churches, the city welcomed him. Some of the nobility attached themselves to him, already envious of the wealth and land ownership of the Church, while the common people gladly heard his sermons, reminiscent of what is said about the Lord Jesus in Mark 12:37. Wycliffe’s vision was to replace existing rich church officials with “poor priests”. Bound by no vows, without formal ordination and living in poverty, they would go from place to place preaching the Gospel, “God’s law, without which no one could be justified”. Two by two they went, barefoot, wearing long dark-red robes and carrying a staff, preaching the sovereignty of God in the Gospel. A papal Bull gave them the name of Lollards to disgrace them – but it soon became to them a name of honour as they made the Word of God known far and wide. It is no surprise that Wycliffe fell foul of the authorities. He was summoned before the bishop of London in February 1377 “to explain the wonderful things which had streamed forth from his mouth”. They did not get as far as a definite examination of his case because an angry crowd gathered, party animosities began to appear, fiery exchanges took place and there was a near riot. After this Wycliffe tried to side step the Church authorities by laying his theses before parliament, and then made them public in tracts. He was again called upon to answer at Lambeth Palace in March, 1378. He came ready to conduct his own defence, but a noisy mob gathered intent on saving him. The king’s mother, Joan of Kent, also took up his cause. The bishops were divided, and had to be satisfied with formally forbidding him to speak further about these things (as in Acts 4:17-18). In 1381 Wycliffe set out his doctrine of the Lord’s supper in twelve short sentences, based upon New Testament teaching. The Church hierarchy along with the chancellor of Oxford University pronounced these false and heretical. Wycliffe in turn declared that no one could change his convictions. Instead he published his second great confession upon this subject in English, intended for the common people to hear about through the preaching of the Lollards. Wycliffe’s old enemy, Courtenay, now Archbishop of Canterbury, called an ecclesiastical court at London to try him formally. During the consultations an earthquake occured (21st May 1382). This terrified the participants who wished to break up the assembled court, but Courtenay declared instead that the earthquake was a sign which favoured the removal of erroneous doctrine from the Church. Wycliffe’s doctrines with reference to transubstantiation and church order were declared heretical and erroneous. To hold these opinions or to advance them in any way was now forbidden and subject to prosecution. Once again Wycliffe was summoned before a synod at Oxford on 18th November 1382. Although he had suffered a stroke, he was resolute in his defence and earned the favour of the court and of parliament. He was not excommunicated or deprived of his position. He returned to his base at Lutterworth (near Leicester), and for two more years continued to send out tracts and preach more determinedly about the evils in the Church. While in his parish church on 28th December 1384, he suffered another stroke, and had to be carried out in his chair. He died just three days later aged about sixty. The influence of John Wycliffe, however, could not be so easily destroyed. He had laid a sure foundation which others would build on, notably William Tyndale. He had lit a torch and kindled a fire which would not go out.